Succulents are plants with thick fleshy leaves. These plants store water in their leaves and stems. This allows the plant to survive in dry conditions or in poor soil that cannot retain moisture. They can survive for long periods of time on only mist and dew. Succulents have many characteristics the enable this. Their outer surface is often waxy, hairy, or spiny. This creates a humid micro-habitat around the plant. Air movement near the surface of the plant is reduced so less water evaporates. Most cacti are succulents, but over 60 families of plants have species that are considered succulents. They are grown commercially as ornamental plants as they are striking and unique in colour and texture. 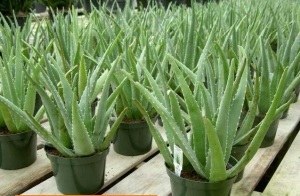 Aloe and agave are two well-known succulent plants. 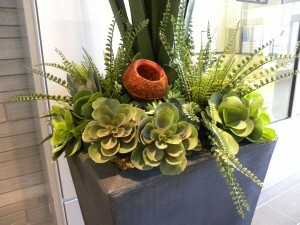 Other include aeonium and echeveria. These two genera have hundreds of species and culitvars. New ones are introduced frequently, with unique shapes and brilliant colours. Some such as the Christmas cactus flower regularly. Sempervevim is a cold hardy genus that most people know as Hens and Chicks. 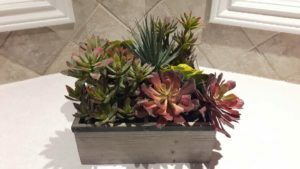 Succulent plants do require substantial light to thrive. This often limits their use in office plantscapes. Fortunately for us, there is a wide selection of artificial succulent plants available. 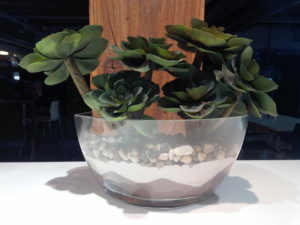 Because real succulents look fake, it is easy to reproduce them in an artificial variety. Lately we have had in increase in requests for custom arrangements such as those in the images. If you do want to grow succulents in your home or office, here are a few tips. Purchase the plants from a reputable nursery. They will be strong and pest free. Use soil specifically designed for this type of plant. Allow the plants to dry out thoroughly between waterings. Water sparingly. Place in bright direct light if possible, although they will adapt to a bit less light. Fertilize regularly from mid-winter through to late fall.